Honeysuckle Medicinal Use and Benefits You Won't Believe! The honeysuckle bushes are good for a whole lot more than making a sweet-smelling wildflower bouquet. Not only are most varieties of honeysuckle edible, the boast copious amounts of medicinal benefits as well. The common and highly invasive vine has been used by herbalist and in traditional Chinese medicine for centuries to treat minor to serious illnesses. The wild vine has been used to help treat and prevent a long list of ailments and disorders. Although, like with most natural herbal remedies, there is no scientific evidence of FDA guidelines to back up the claims of success from herbalists or other users of honeysuckle home remedies. Some users maintain using honeysuckle is useful in treating cancer symptoms. Honeysuckle is a great source of Quercetin, an acid that thwarts free radicals internally, vitamin C, calcium, potassium, and magnesium. The beautiful vine also possesses a vast array of natural antibacterial and antiviral properties. Honeysuckle medicinal tea and a syrup have been used to help treat pneumonia, staph, tuberculosis, chicken pox, and salmonella, and strep infections. The wild invasive bush also contains salicylic acid – a natural predecessor of aspirin. The stems from honeysuckle bushes can be rubbed directly onto the affected area of the skin to help relieve swelling and to dry up a rash. Although any part of the plant can be used to help treat a skin condition, it is the stem that seems to provide the best and most timely results. Honeysuckle stems have also been ingested after being chopped finely or mixed into a syrup in an effort to treat mumps, arthritis, and hepatitis. The stem is the base of the long white or yellow floom leading up to the blossoming flower. The bark of the plant can have a diuretic effect on the human body. Because of this quality, honeysuckle bark has been ingested to treat conditions such as kidney stones, gout, and various ailments of the liver. The plant’s leave are often used in natural mouthwash recipes and used as a facial astringent. Although it is usually only the blossoms that are used in creating homemade flower perfume, the leaves can be infused into such a mixture as well to create an overall natural beauty recipe. The leaves can also be tossed into the medicinal honeysuckle tea in an effort to alleviate sore throat pain more quickly. Learn to identify the leaves of the honeysuckle plant so you can easily identify it even when no in bloom. When harvesting honeysuckle flowers for medicinal use or cooking, it is best to pluck them from the stem as close to the branch as possible to avoid losing any of the nectar contained in the stem. Honeysuckle flowers are the primary ingredient in the medicinal tea, syrup, and glycerite brewed from the plant. They are also the most often used part in recipes containing the wild edible. The taste of honeysuckle is so deliciously sweet it has been used to make both ice cream and cake. If you have goats on your survival homesteading retreat, you will never have difficulty identifying honeysuckle vine even when the bushes are not in bloom. Goats of all breeds just can’t seem to resist the sweet taste of the entire plant year round. The leaves, flowers, and stems of the wild edible can be dehydrated and stored in an airtight container for long-term use. If using an electric dehydrator, dry the plant at the lowest possible setting (approximately 130 degrees )to for approximately four to six hours – or until the wild edible has a crispy feel. 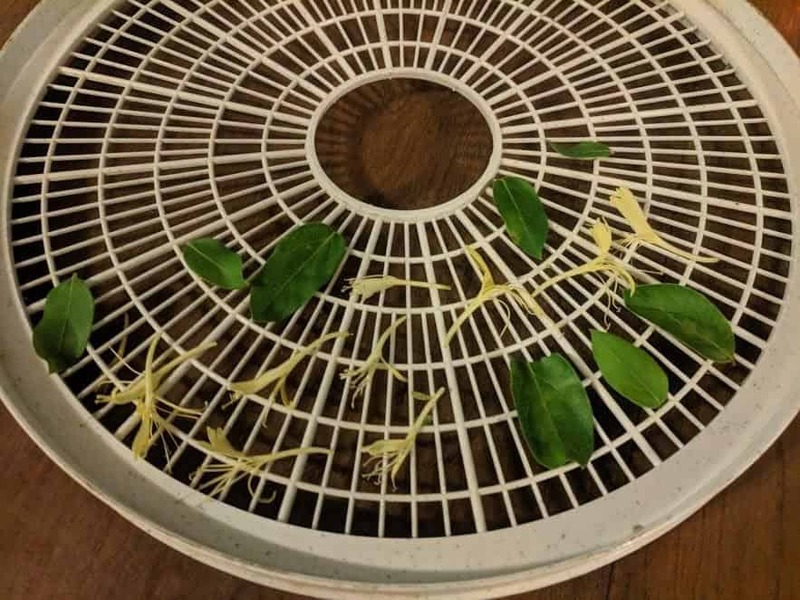 You can finely chop the honeysuckle parts and blend them into a powder once they are dried, place a plastic solid or mesh liner into the dehydrator tray to hold the fine matter. Make sure to leave plenty of room for air to circulate around the flowers, leaves, and stems if you leave them whole. Mix together all of the ingredients in a medium pot. Turn the burner to medium heat and stir constantly while the mixture comes to a boil. Turn down the heat and allow the mixture to simmer for about four minutes. Remove the pot from the stove and allow mixture to cool entirely before storing in a Mason jar or other airtight container. You can use the medicinal and sweet syrup as a topping for desserts, pour a pinch into water, tea, or lemonade, or freeze in ice cube trays to preserve it for long-term use in recipes and cough natural homemade cough syrups. Bruise or lightly crush the honeysuckle flowers between your fingers or gently with a wooden spoon. Place the flowers into a pitcher – or a cup if making a single serving. Pour the water over the flowers and stir. Place the pitcher or cup into the refrigerator or a cool place or at least six hours – overnight is best, if possible. Strain the flowers through cheesecloth, a coffee filter, or clean T-shirt, etc. Drink the tea over ice or heat it through to serve as a hot tea. * You can also make a honeysuckle sun tea by putting the same mixture into a pitcher and placing it in direct sunlight for about four hours, depending upon the season. Fill a glass jar of your choosing with honeysuckle flower blossoms leaving only about a half an inch of headspace. Pour vegetable glycerin into the jar, still being mindful of the headspace. Put a lid on the jar and place it in a sunny spot – a windowsill works great. Shae the jar once daily to move the honeysuckle flowers about in the glycerin or 30 days. Strain the flowers from the mixture using cheesecloth or a similar material, at the end of 30 days. Store the honeysuckle glycerin in an airtight container in a cool dry place until ready to use. This natural concoction makes a superb remedy for sore throats. Adults can take one teaspoon of the glycerite up to three times per day. Reduce the dosage amount by half for children. Honeysuckle remedies are intended only for short-term use. The flowers, leaves, and stems are extremely low in toxicity, but prolonged use could cause negative effects. Folks with an allergic reaction to tree pollen could also have an allergic reaction to honeysuckle. Symptoms of honeysuckle poisoning include drowsiness, photosensitivity, and dilated pupils. Individuals undergoing treatment for chronic illnesses or experiencing diarrhea could have an adverse effect when consuming honeysuckle. The wild edible may slow the clotting of blood and could pose a risk if surgery occurs within two weeks of consumption. Proper identification of honeysuckle is essential when foraging for the wild and medicinal edible. Although most species of honeysuckle are not poisonous (like the Japanese variety shown in the above photos) some species of the plant contain glycosides in the stems and vines and carotenoids in the berries. Honeysuckle plants of this type can be at least mildly toxic to adults and more harmful to young children and pets. A great book on herbal and natural medicine is The Everyday Roots Book – it’s 350+ pages will show you how to replace all of the toxic products and medications with safe natural alternatives. This book is a must-have for all preppers and homesteaders. Check it out here. Tara, this is awesome information! Very cool! Good information as honeysuckle is everywhere in the south. I was taught to use only the fresh white flowers for jams and jellies. Glad to know I can use the older yellow ones for other uses and leaves for skin rashes. Are the leaves also good for bee stings? Because of a cooler than normal spring, the honeysuckle is blooming later this year. I tried something new last year, and I may do it again…if time allows. I made honeysuckle jelly. Absolutely everyone who tried it loved it. Tara, Thanks the timing couldn’t have been better. I noticed yesterday my honeysuckles are starting to bloom. I have done jelly but I am thinking of syrup also now and maybe even some tea. OUTSTANDING ARTICLE , all bases covered …. Been pluckin’ and suckin’ the flowers for 60 years now . I enjoyed the article. did not know all the uses for the entire plant.. ours has bloomed and is still in blossom…need to get some dehydrated. Not entirely related, but my 2 Persimmon trees have more little fruits on them than ever! To raise Persimmon, a 2nd tree is necessary for pollination. This is the first year I have so many little fruits! As a matter of fact, the only time they have borne fruit is 2015. They were planted in 2009. The Persimmon is more of a southern producer than northern & I figure this is why they have not produced regularly. They are a more northern variety, but our Winter’s here (Chicago area) have dragged on quite a bit since they were planted. Neither my Peach trees nor my Apricot bush have produced a blossom this year. Prolly due to the colder Spring. Hope all are well & prepping ever onward, w/Our Lord’s Blessings! Great article! I will be saving it. I found this year that my chickens like honeysuckle. I like the ability to take better care of myself an others and the fact that most home remedies are safer than using modern medicines which we may not always understand or have enough information to use as safely and effectively as we’d like. And if the world goes to hell in a handbag we might have to learn to rely on natural medications and good nutrition to live healthy lives. It just feels right to utilize natures resources promoting a green lifestyle that supports the natural cycles and processes of the organic world rather than working against it or harming the ecosystem. And the best part of it is that nature’s medicine is always free.